If, like me, you're not quite back into the morning routine yet, whip up a batch of these healthy flapjacks for breakfast on the run. Unlike cereal bars, many of which contain more sugar than a can of coke, they will keep you going until lunchtime. 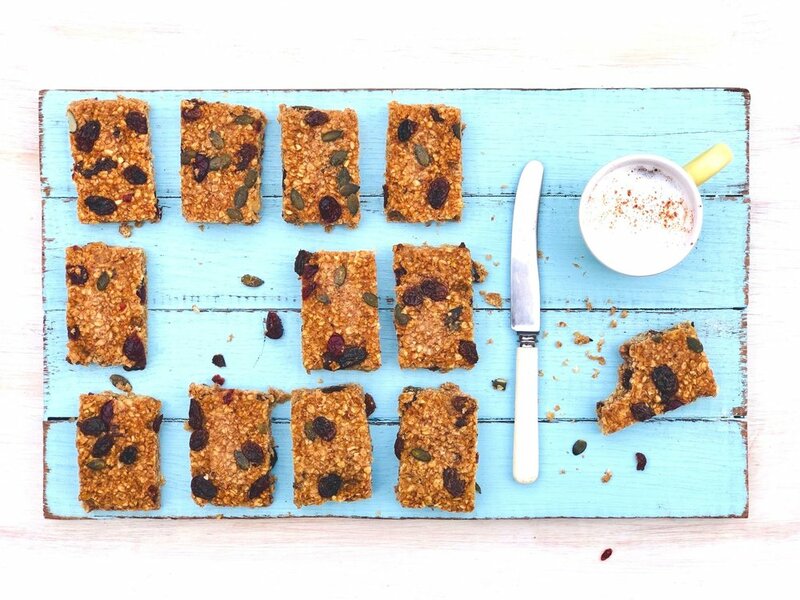 What makes these flapjacks healthy? Well, they contain natural sugar from bananas and dried fruit instead of refined sugar. You may wish to add a little honey, depending on how ripe your bananas are. They are also packed with oats, which release their energy slowly so keep you going all morning. These flapjacks also contain very little saturated fat as I've swapped butter for oil and peanut butter. I've added some nuts and seeds as they give a lovely crunch and also contain lots of vitamins. I am crazy about cinnamon and ginger so I add both, but leave them plain if you prefer. Preheat the oven to gas mark 4 / 180 C / 160 fan. Line a 23cm square tin with baking paper and brush the paper very well with oil to stop the flapjacks sticking. Place the oil, peanut butter, honey, spice and bananas in a bowl. Mash everything together really well into a smooth paste. Add the oats, fruit, nuts and seeds. Stir everything together until it is well combined and the fruit and nuts are evenly distributed. Pour the mixture into the prepared tin. Use the back on a wet spoon to spread the mixture out evenly and press it down into the tin. Bake for 25-30 minutes until golden brown. Remove from tin and leave to cool on a rack. Slice into 12 pieces and store in an airtight container in the fridge for up to 3 days.